One of the first things you notice on a off road vehicle is the front bumper. Putting an off road bumper on your Xterra not only serves to good looks but is a crucial component to off road functionality out on the trail. A (N50) Nissan Xterra (off road front bumper will increase your approach angle allowing you to get your tires on top of a trail obstacle instead of running into it. When dropping off of ledges, or simply getting through trail obstacles, there is a high risk of your Xterra hitting the front bumper. These off road bumpers are typically made of steel or in some cases, aluminum. Either way this is far more robust than plastic OEM bumpers that the (N50) Nissan Xterra comes with from the factory and ultimately serves as a form of front end protection. 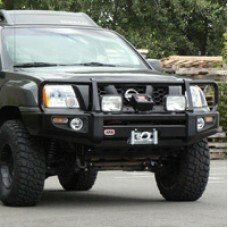 A new off road Nissan Xterra front bumper also has accomodations for a winch and recovery points. Both of these features are very important in the event that you get stuck out on the trail. The recovery points will allow you to attach a shackle at the end of a recovery line, to the bumper. This way another vehicle can apply tension to the line in an attempt to dislodge the vehicle. Installing a winch into your (N50) Nissan Xterra off road bumper will allow you to be more self sufficient in dislodging your own vehicle without another vehicles assistance. This is done by attaching the winchline to a solid anchor point such as a large boulder, or tree and spooling the winching line. (N50) Nissan Xterra off road bumpers are bolted to the frame for maximum strength and reliability which works out well in these heavy duty use cases. (N50) Nissan Xterra 4x4 bumpers are also available for the rear. These off road bumpers also have recovery points and typically include a tow hitch. These are also typically made of steel and bolt directly to the frame. They offer higher ground clearance as well as protection. (N50) Nissan Xterra off road Bumpers are also powder coated, unless stated otherwise, which offers a thick long lasting reliable finish which protects against rust and other signs of aging. Here you’ll see our selection of (N50) Nissan Xterra bumpers (N50). Fits years 2005, 2006, 2007, 2008, 2009, 2010, 2011, 2012, 2013, 2014, 2015*Note: If your vehicle isn't equipped with factory fog lights, then an additional wiring harness and switch will be needed. ..